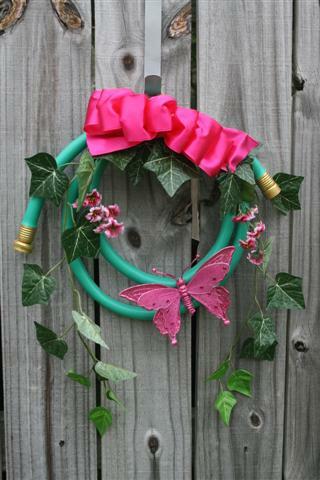 Have you made a Garden Hose Wreath? My garden hose wreath was a fun wreath. It is a small wreath and very simple. I used a 6 foot leader hose and after forming, it is only about a foot in diameter. 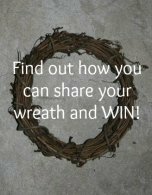 So depending on how big you want your wreath you will have to plan your length accordingly. I took the wire tie that was on the hose when I bought it and tied the top to hold it in place spacing it so you could see the ends. Next I added two ivy sprays by tucking them also in the wire tie. Then I took a pipe cleaner (got to love those things) and attached the two sprays of pink flowers so they would not show. I made a layered bow out of bright pink satin wire ribbon and tied it to the top. Finally I hot glued the pink butterfly to the bottom. Unique gift and party decoration all in one. This would make a great gift for a gardener friend. ... you could attach them to a wreath. They could enjoy the wreath as it is or take the items apart and use them.